According to the latest United States Drought Monitor, cold, dry conditions in Kansas continue to inhabit the state and could present a threat to the winter wheat crop. 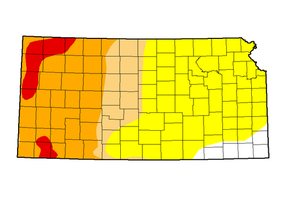 The Drought Monitor shows about 95% of Kansas is currently “abnormally dry,” with 47% of the state experiencing “moderate drought” conditions that have threatened farmers’ crops. These unfavorable conditions have led the USDA to recently designate 37 counties in Kansas as primary natural disaster areas. Shawnee County and the majority of the eastern half of Kansas are being classified as abnormally dry, but not yet in drought. However, drought conditions appear to worsen moving westward. A Farm Futures article notes the recent weather conditions could present a concern to winter wheat farmers, as sub-zero temperatures and dry weather continue to take hold. In the article, Brad Rippey, USDA Meteorologist, notes the changes from extreme cold to relatively mild in the matter of days are the biggest threat. Rippey says, "It's not just the extreme temperatures but these rapid variations that can also stress wheat. We have seen quite a bit of this in the last few months." However, Jim Shroyer, Kansas State University Extension wheat specialist, explains in the same article that winter wheat is extremely resilient in the mid-winter months. "From mid-December to Mid-January, that's when winter wheat is its most winter-hardy. It can tolerate some pretty darn cold temperatures at that time, and still shake it off and just be fine." The dry, fluctuating weather conditions across Kansas have resulted in natural disaster declarations by the USDA and have posed a severe threat to the winter wheat crop, according to reports.